Ever try to customize a 404 page in WordPress? Then try to tell a client how to do it with PHP inside a function file? One of your most important pages on a new or active website is your 404 error page. I found out about mine while tracing links to my site by performing keyword searches in Google. With a WordPress site you get this generic error “Whoops! Page Not Found” with some “, you didn’t do anything wrong. It appears that the page you are looking for does not exist…” thrown in as well. There is also a search box that could expose all sorts of pages you thought were inactive. You’d be surprised at all the legacy links that lurk on the internet. When I first researched how to to this I found a bunch of PHP markup in a 404.php file and my eyes quickly glazed over. I thought Headway could do this and quickly opened up my WordPress tools and accessed Headway 3.7.12. This page if setup right could be a boon to your seo by repointing to key parts of your website or landing pages to correspond. 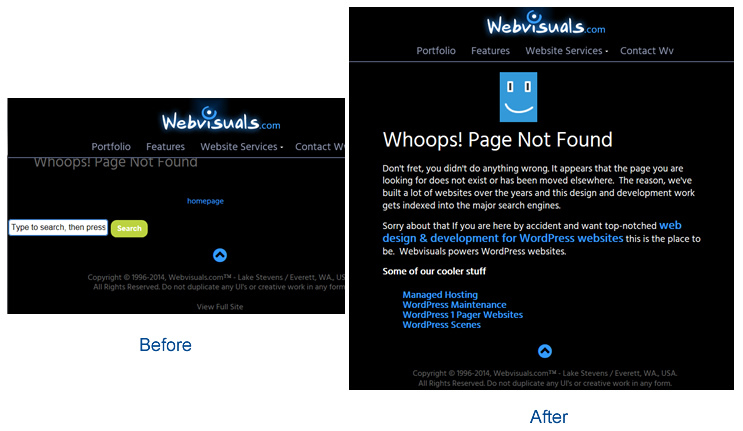 Open up Headway and in the dropdown nav on the header menu select 404 Layout and click on the blue edit button. click on Edit Content box and type in what message you want the user to seek. Customize it in the Headway paint tools and your done.